Ring! Ring! The crystal ball rings at the main office of Broom Service Inc, the realm’s premiere potion delivery service. “I need two large healing potions and a martini,” says the unidentified voice at the other end. “The healing potions are sort of urgent… actually, so’s the martini.” Mere seconds later, multiple teams of highly trained delivery witches hit their broomsticks and zoom out from the high windows, delivery satchels on their backs. 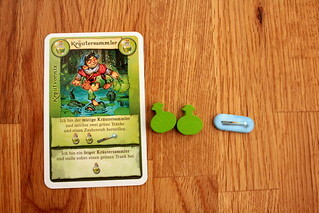 That sounds like an average day of work in Broom Service, the Kennerspiel 2015 nominee by Andreas Pelikan and Alexander Pfister: zipping around on broomsticks, collecting potion ingredients and delivering urgent potions. You do that through a role-selection mechanic similar to Pelikan’s earlier game Witch’s Brew, but Broom Stick is an all new game with a similar core mechanic, not a mere reimplementation. For each of the game’s seven rounds, players pick four of their ten role cards. These represent all the actions a player can take for this round. But they can’t be sure in what order they will take those actions, or how powerful they will be, because the other players have a lot to say about this. The first player picks one of his four role cards, declares it to the other players and also declares if he is a brave or a cowardly representative of the chosen role. The brave option always yields a more powerful action, but it can be stolen by the other players. They all take their turn after the first player declare a role. If they hold the same card in their hand, they must declare it now and pick the brave or cowardly action themselves. Anyone picking the cowardly option takes it immediately, no one else is able to interfere with that. But if you pick the brave action you only take it at the end of the round, and only the last player to pick it will actually get to take it. So picking brave if you’re the first player in a five-player game is not as much brave as careless. Picking it if you’re the last player is a no-brainer. But there’s more to the decision than that, you have to read the table right and see who of the other players is likely to hold that card and who, given the state of the game, probably doesn’t. That’s not as hard as it may sound at first, because there are only four different types of roles and for most of them you can hazard a decent guess who might have them. The roles cover the whole production process of the potion delivery industry. At the start are the collectors, three different ones for the three colors of potions. As a cowardly collector you always take one potion of the appropriate color. Being a brave collector is worth a total of three resources – potions and magic wands – but collector is the most dangerous role to pick bravely: there are no prerequisites to being a collector, so other players can always turn out to have that role. Next, there are the highly trained delivery witches. They let your two pawns move around the game board. 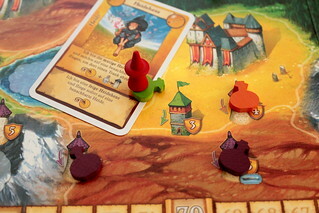 There are four witches, corresponding to the four landscapes on the game board. A cowardly witch may move one of her pawns to an adjacent region of that type. A brave witch may also deliver a potion to one of the towers there. There are only a few towers in each region, and most of them only take one delivery per game. Delivering to a tower is rewarded with victory points and sometimes with magic wands. Who might have a witch is a bit easier to predict already, people can only move into adjacent regions and will usually want to move in a direction where there are still potions to be delivered, preferably of a color they already have. It’s not foolproof, but risking a brave witch even when you’re not the last player is often reasonable. While witches main job is to move around and they only deliver as an added benefit, druids main job is to deliver. There are only two druids, each of them covers to landscapes. If he’s cowardly, he delivers the potion for the price the towers inhabitant is willing to pay. If he’s brave, walking past the guard dragons without flinching back, he’ll also get a tip of three victory points. Druids are the easiest to predict, someone that doesn’t have anything to deliver, or is not in the right landscape, is less likely to have picked that druid. Of course, it’s not an exact science. Someone might have planned to play the druid later, after playing a collector first. But if picking the brave option was without risks, it wouldn’t be called the brave option. The final role is that of the weather fairy. The people at Broom Service Inc. have understood the importance of diversifying their services and are running a brisk side business in cloud removal. That’s the weather fairy’s job, she uses the magic wands collected by playing collectors and delivering potions to remove a cloud from a neighboring region. 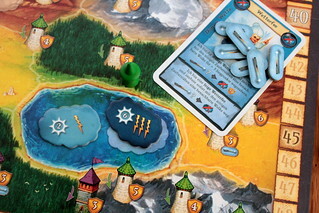 Those clouds are worth extra points at the end of the game, but they also have a more direct effect on the main business: witches won’t enter regions with clouds in them because the humidity makes a mess of their hair, so some regions must be cleared by the weather fairies first before deliveries are possible. The fairies are also easier to predict: a player with no magic wands or not close to any clouds probably didn’t play the fairy. Helping you to figure out what roles the others might have chosen are the event cards, one of which is revealed per round. They include effects like bonus points for ending the turn on the right landscape, or losing points for ending on the wrong landscape. More intricate events let you discard resources for points or even let you pick a different number of role cards for a round: the fewer you pick, the more bonus points you score. That one forces some tricky decisions. All the events have some impact one what roles everyone might pick, so they give you additional information to base your own picks on, but at the same time they influence your picks. You always have to weigh those events against your other interests against what you think the others are going to pick. No one said delivering potions was easy. When playing with less than five players, there is one more rule to help you decide on your roles. Or make the decision harder, depending how you look at it. For every player missing to a full game of five, one role card is cursed each round. You can still pick a cursed role, but doing so will punish you with a three point penalty. That might not be enough to get you away from that role, but it gives you yet another incentive to pick something else. I don’t believe in clouds! There are many things that factor into figuring your role picks, and while that is a great thing for your own roles, it makes the game very hard to play with more players. Just try to figure out what four other people are thinking about all those things and which they consider more important, and then try to pick roles that somehow work between all those. It can’t be done. It takes forever to figure out and it still can’t be done. And that’s not the biggest problem in a full game, either. Because of how the start player works – the last player to pick the brave action for one card leads with the next card – it’s possible that you won’t be the start player for a full round and be forced to play your cards out of order. That doesn’t sound so bad, but if you must play your delivery druid before the witch to move into the right region, and then your witch before the collector to get a potion you want to deliver, then that’s frustrating. Of course you could plan around that, too, and only pick roles for one round that don’t depend on each other. But playing like that is slow and tedious, and with only seven rounds to collect points you really, really don’t want slow and tedious. That changes a lot with two or three players. You have a much better chance to predict the others’ roles, there is less of a chance to get the order of your actions messed up and the game is much more fun this way. When I read the package saying “plays especially well in two players” I was doubtful, because the mechanic of picking brave and cowardly roles sounds to me like it’s made to work with many players, but Broom Service is a whole lot more fun in fewer players. But then, the brave/cowardly mechanic is made for more people, so the sweet spot of the game is three players. With three players it’s manageable, but all the game’s mechanics really come into play. That’s my big gripe with Broom Service, and ultimately why it’s not my favorite for the Kennerspiel award: for a game that plays two to five players, it just doesn’t work that well for me outside of that sweet spot. Three is great, four is okay, five is too chaotic and two is basically a different game. What we presented in this review, by the way, is the basic game. There are a number of variants that are fun to play and make the game more complex, but they don’t really change anything about that central issue. If you’re looking for something to play three or maybe four people, then Broom Service is a very solid game, but if you’re looking for a wider range of players, at least give it a try first and see how you like it. Next Post:Meople News: SPACE VIKINGS – did I really not use that title before?